Fortunately, there's a setting built into iOS that delivers more information about how much energy your phone has left. You can view your battery life as a percentage and avoid the dreaded red battery icon. When you can easily check your iPhone's battery percentage, you have easier-to-understand and more accurate information about your battery. 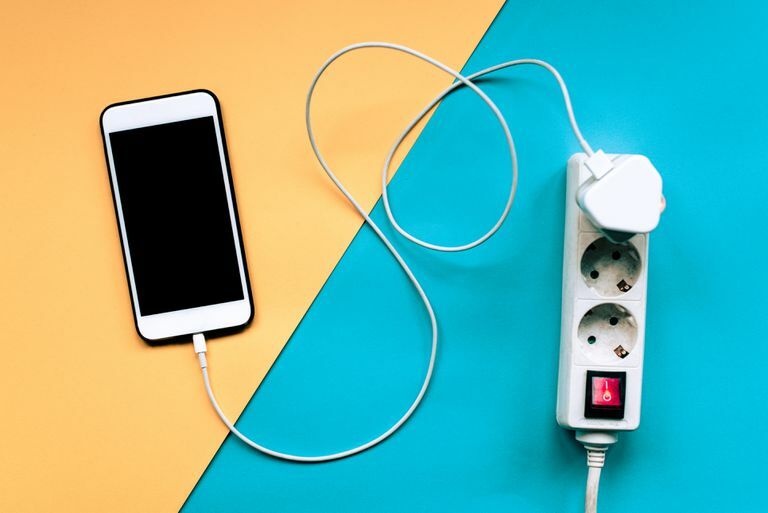 You'll know when it's time to recharge and whether you can squeeze out a few more hours of use or if it's time to put your iPhone into low power mode. Up until iOS 10, you could view the battery percentage in the top right corner of every screen where the battery icon appears by changing the Battery setting. That changed in iOS 10. Now you can only view the percentage of battery life you have left in the Control Center, and you don't have to change any settings to see it. Open Control Center. How you do this depends on what iPhone model you have. On the iPhone X and newer, swipe down from the top right corner. On all other models, swipe up from the bottom. You can see the battery percentage in the top right corner of the Control Center screen, next to the battery icon. All other screens display the default battery icon without the percentage. In iOS 9, you can view your device's battery life as a percentage on any screen by changing the Battery settings. Slide the Battery Percentage button to On/green. If you're running iOS 4 through iOS 8, the process to view the battery use as a percentage on every screen is slightly different. Choose General (in iOS 6 and higher; if you're on an older OS, skip this step). Slide the Battery Percentage slider to green in iOS 7 and iOS 8 (slide it to On in iOS 4 through 6). If you're running iOS 9 or higher, there's another feature in the Battery settings screen (Settings > Battery) that you might find useful. The Battery Usage section lists the apps that have used the most battery life in the last 24 hours and in the last seven days. With this information, you can pinpoint battery-hogging apps and delete them or use them less, which in turn extends your battery life. To view the timeframe for the reporting, tap either the Last 24 Hours or Last 7 Days tab. When you do this, you'll see the percent of the total battery used in that period that was used by each app. Apps are sorted from those that used the most battery to those that used the least. Some apps include basic information beneath them about what caused the usage. You may see a note that reads Background Activity or Low Signal. These notes explain why the app used so much battery power. To get more detailed information about each app's battery use, tap either the app name or the clock icon in the top right corner of the Battery Usage section. When you do this, the text beneath each app changes a bit. For example, a podcast app might tell you that its battery usage was the result of two minutes of the app being used on-screen and 2.2 hours of background activity. Being able to get this information is essential if your battery is draining faster than you expect and you can't figure out why.